If you’re a frequent follower of Cracking the Cover, then you know how much my daughter (now 16 months) loves books. It’s a passion I have no problem fostering. 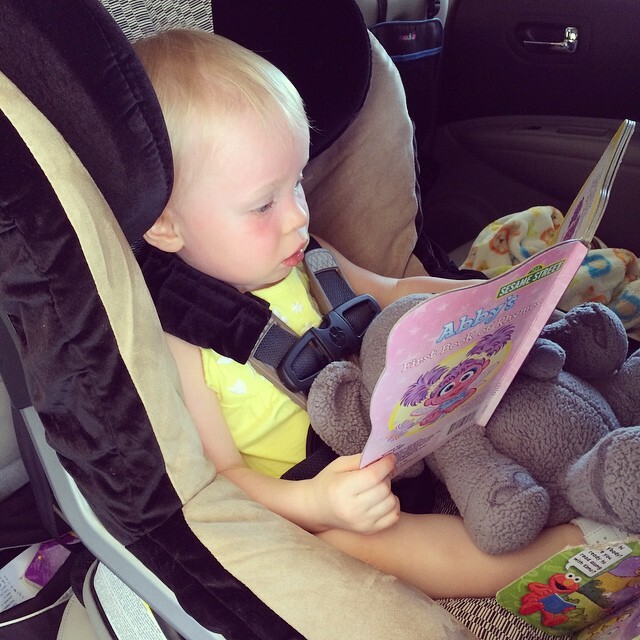 When I was little, we took books with us wherever we went, and I’ve continued that tradition with my little girl. That means keeping books in the car and in the diaper bag. 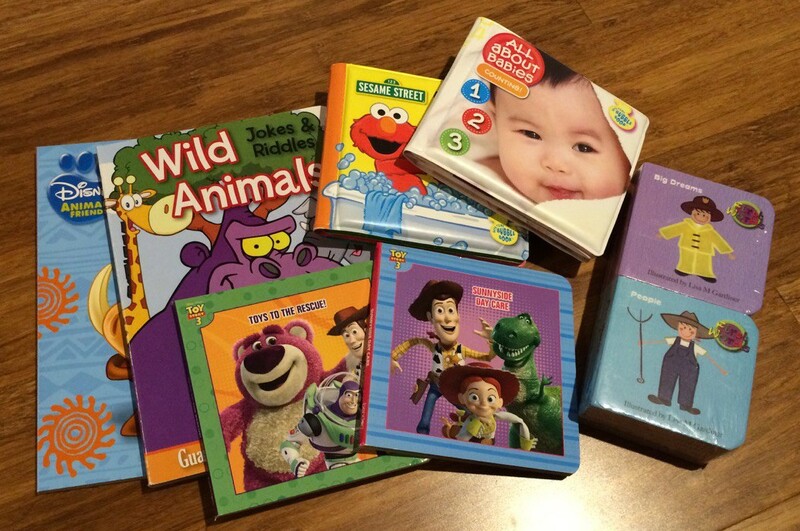 But board books can be heavy and bulky, which can make carting them around a pain. My solution — the dollar store. Yep. You read that right. I have discovered a treasure trove of books at the dollar store. Now as you might have guessed, the physical quality of books sold at the dollar store is not great, but that’s what makes them ideal for travel. The material (usually cardboard) and varying sizes — makes them lightweight and easy to tote around. I love that they don’t take up a lot of space. There are ones specifically designed to get wet — perfect for the beach, bathroom or a restaurant. And the smaller ones often come in a package of two. At that price, you don’t really care if it gets lost or ruined. I am discerning when it comes to the book content. 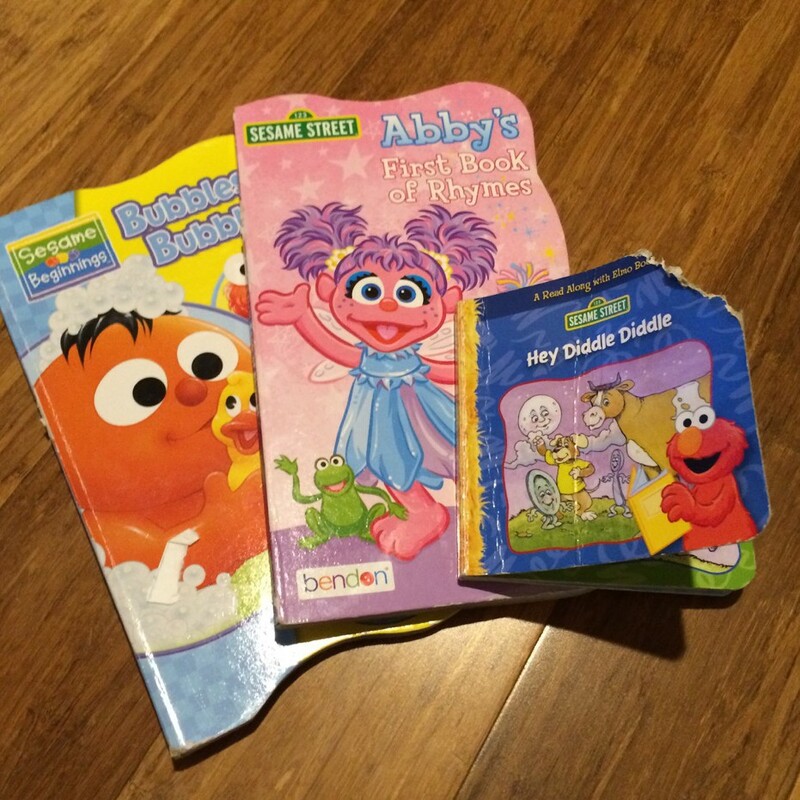 You’ll often find big names attached to these books — Disney, Sesame Street, Hello Kitty, Playskool, etc. We’ve only bought three Disney books (I’m trying to avoid the whole princess thing for as long as I possibly can), but we snap up any Sesame Street ones we come across. The dollar store is a once or twice a month thing, and I usually spend about $5, which equates to anywhere between five and 10 individual books. We’ve been doing this for about four months now, and I’ve only thrown out two because the binding was broken past the point of repair. I have, however, reinforced the binding of a few favorites with tape. And “Hey Diddle Diddle” underwent an unfortunate teething event. Books can be really expensive, but the dollar store is an affordable option.